International Car-Free Day, September 22, is a day that in the Bay Area we don’t normally pay much attention to. But given that the week-long festival celebrating Critical Mass was just beginning, this year we had to do something special. 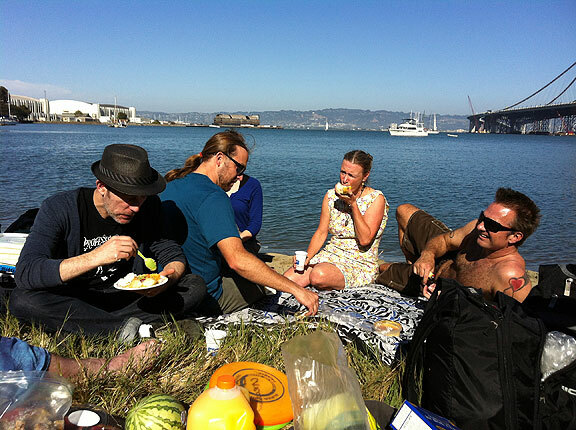 So we went to the middle of the San Francisco bay to have a Car-Free Day Picnic! Yes, it took three van-loads to get us all there with our bicycles, but after a somewhat contradictory and ironic interlude of driving back and forth, the picnic was underway under sunny skies, sheltered from the mounting wind and fog rolling in through the Golden Gate as the afternoon started to wane. Just the day before, Friday September 21, was International Park(ing) Day, when people take over parking places and turn them into parks for the day. 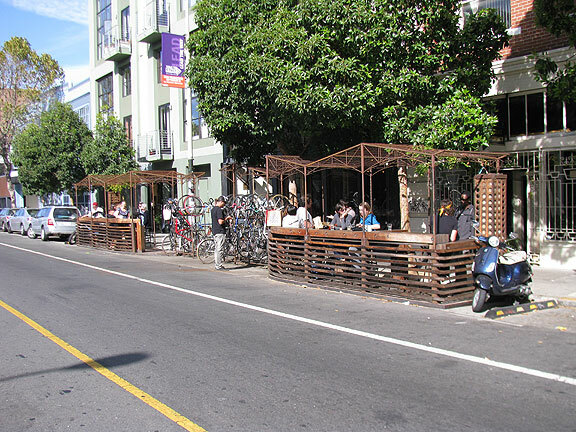 It was well represented along Valencia Street, where a half dozen permanent parklets have replaced parking places during the past couple of years. 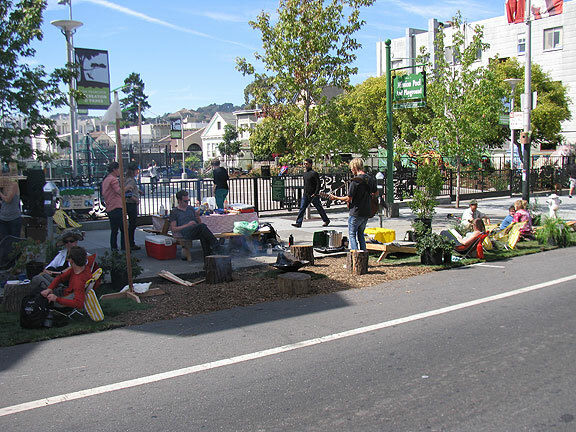 Park(ing) Day started in San Francisco about six or seven years ago, instigated by the folks at Rebar, and it, like Critical Mass, has spread around the world. 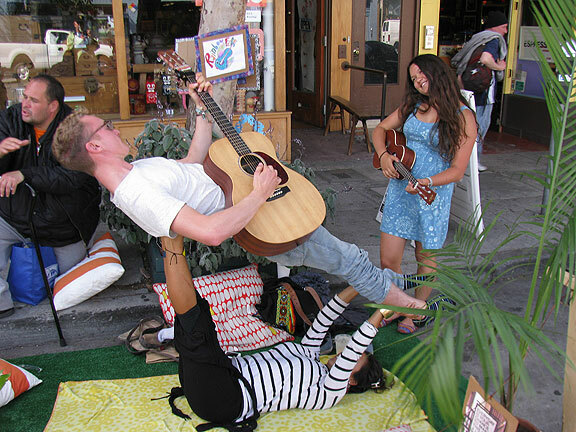 Look what people do with parking spaces when Park(ing) Day rolls around! The Valencia Pop-Up Habitat was one of the coolest of the day's reclaimed spaces. Park(ing) Day didn't have quite the participation as in recent years, perhaps because so many delighteful parklets have been established permanently... This one in front of Four Barrel Coffee is one of the best. 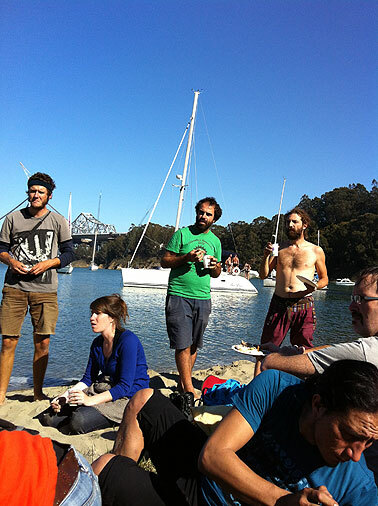 We wanted to bicycle back to San Francisco as an act of civil disobedience, not to get arrested, but to physically demonstrate the necessity of access to the Bay Bridge, and to underscore our simple and cheap solution. Go back to the 6-lane configuration that existed from the 1937 bridge opening to 1962, and give the sixth lane to bicycles and pedestrians—all this for a few thousand dollars and a day or two of work, compared to the 10 years and $1 billion estimated by Caltrans for their hair-brained scheme. 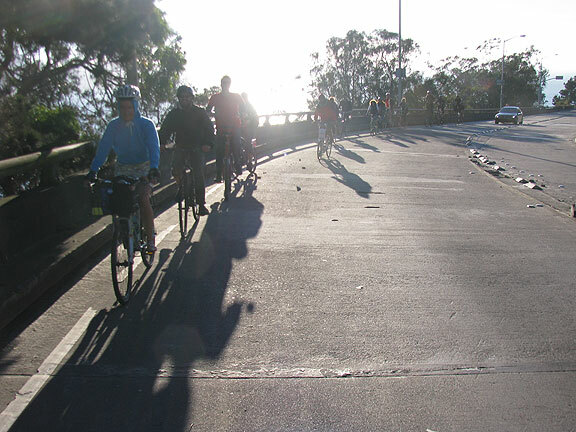 We came very close to riding the bridge, but due to an unpredictable sequence of events, our plans were thwarted. We waited for the right moment to head up to the Bridge. As we finished our convivial picnic and mustered our determination to cross the bridge, the word arrived that the California Highway Patrol (CHP) had pulled a car off the bridge and the officer was ticketing them just below our starting point. OK, we would wait. Then it turned out that the motorist was being put in handcuffs, arrested, his passengers evicted from the automobile, and the car was being impounded. More CHP, and a further wait for a tow truck. Finally after 45 minutes it was over and the CHP drove away (or so we thought). 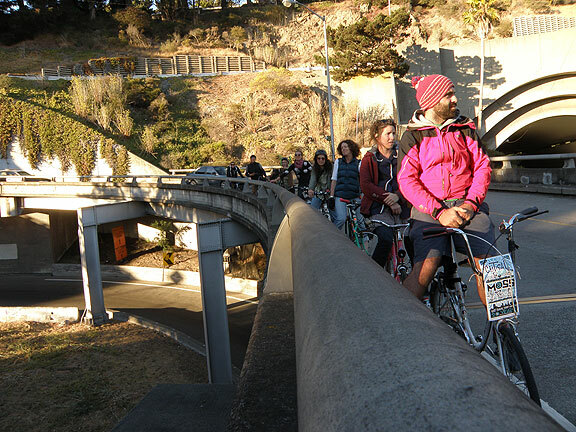 Our plan to enter the fast-moving traffic at the Yerba Buena Island entrance was to use a vehicle to block for us, rolling into the right lane with flashers on in a way that we could maneuver ourselves in front of it. Then they would stay behind us as a protective barrier as we would be riding at 10-15 mph while the cars were whizzing by at 45-50 mph. Riding up to the onramp to the Bridge. There were high winds by the time we started our approach to the bridge but our adrenaline was flowing and all 17 of us were ready to make the ride. We rode up the long incline to the ramp that curves down to the beginning of the Bay Bridge’s west span. As we reached the entry point we divided ourselves along right and left and let cars pass us, expecting our support vehicle to appear in seconds. Two or three long minutes went by without seeing him, and then suddenly there was a CHP vehicle (later we learned it was the same officer that had the arrested driver in the back of his car—why had he returned to the island? 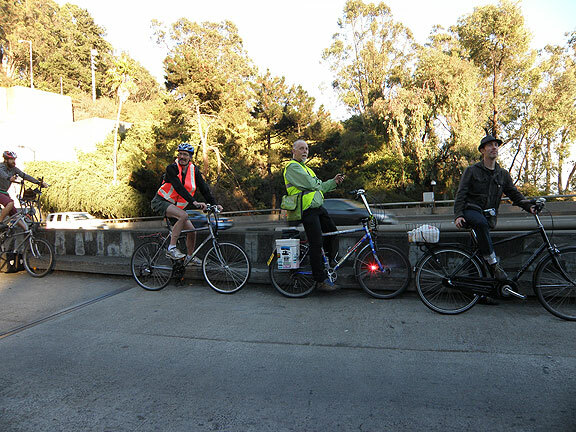 A mystery) who upon seeing us boomed out from his PA system: “All you bicyclists MUST NOT ENTER THE BRIDGE! Turn around now!” We felt caught, so we started to circle back to demonstrate compliance. Still our support vehicle had not appeared, but just as we were riding up the ramp, there he was. Now what? Some people wanted to turn around and go for it. Many others had lost their will. We had not prepared for this particular contingency and it was difficult to make a decision in the middle of the ramp, so we rode back to our starting point. It was clear then that most of the 17, many of whom were friends from afar in town for Critical Mass celebrations, weren’t too keen on getting arrested. Having lost the small element of surprise we were counting on, I too felt like it was a good time for a strategic retreat. Easing off from the adrenaline of an “almost action” is never easy, but we decided to return home, stay together, discuss and take note of what we learned. 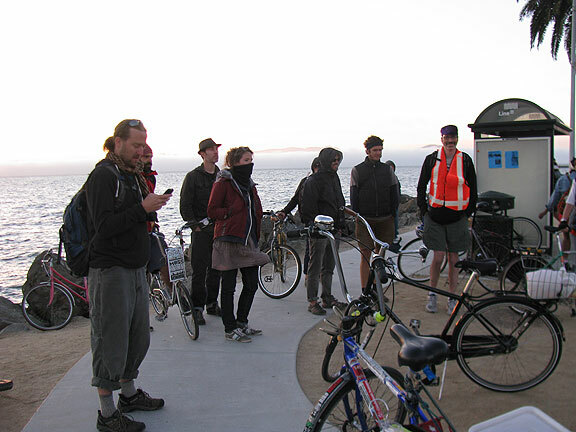 We learned that the only way to have a group ride of 17 bicyclists to Treasure Island from San Francisco is by car or by bus carrying two cyclists at a time, resulting in 90 minutes and many trips before everyone got back together. We knew about the enormous grates on the bridge that are a peril to bicycles and require updating to be traversed in the safest manner. 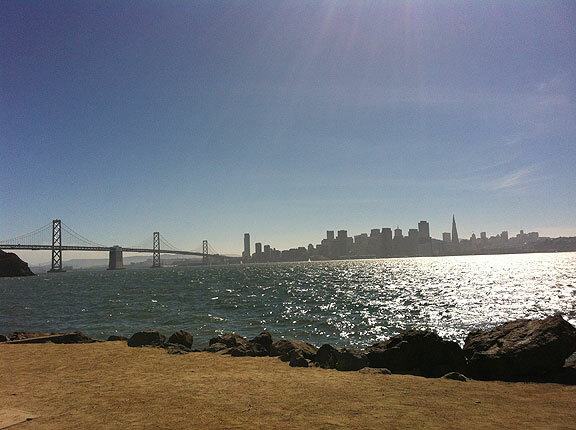 We learned that the entrance from Yerba Buena Island onto the bridge is perilous at best. Bicycles and pedestrians require a dedicated lane from Oakland all the way to San Francisco. 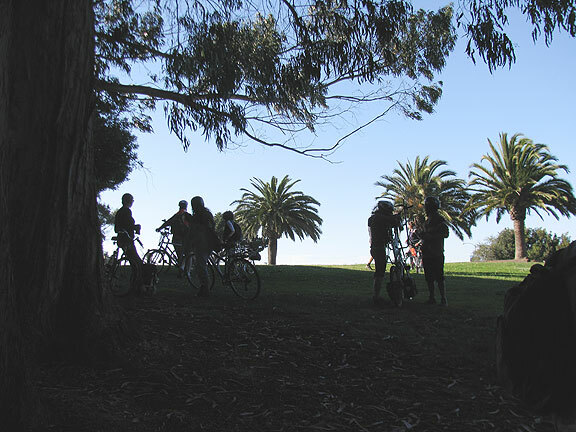 It will take a “critical mass” of local supporters to bridge the gap across the Bay in a timely and inexpensive fashion. Freezing at the bus stop on Treasure Island, waiting to go 2 at a time every 20 minutes. Ultimately we proved our point, which is that lack of access to the Bay Bridge for bicycles is an absurd impediment and blatantly discriminatory towards those of us who prefer not to depend on private cars and oil to move around. 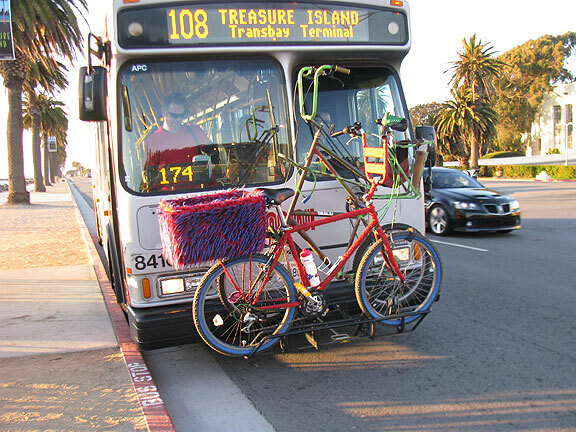 No one will be commuting by bike from Oakland to San Francisco if they have to stop at Treasure Island and depend on a bus that runs only every 20 minutes and takes only two bicycles per journey (we asked to bring more bikes in, as we were stuck there, and the drivers were utterly uninterested and refused—thanks MUNI! Always so flexible and helpful!) And thanks to our strategic retreat, no one is in jail, facing charges or fines, or anything else. Instead we had a lovely ride back from the Embarcadero along Mission Creek all the way to the Mission where we had a party until midnight. 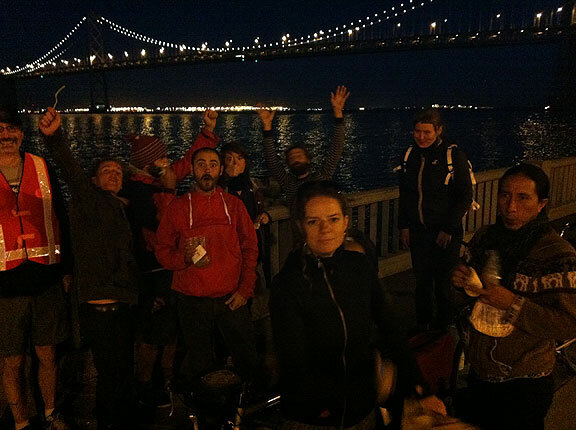 Most of the gang back on the Embarcadero after the action... a glorious day and night, regardless! And to conclude, here is the text of our flyer we are distributing around now. Feel free to reprint and repost as you see fit. A Bay Bridge for Everyone! is a bit lower than the car-choked road deck, putting cyclists’ noses at exhaust pipe level, ensuring a face-full of vehicular exhaust instead of fresh air for bridge-riding cyclists. A 2001 Caltrans study concluded that a continuation of the path was possible, for a cost of $160-387 million. A September 12, 2012 article on SFGate.com suggests it could cost $800 million or even a billion to build new decks hanging off both sides of the west span. This is a calculated effort to stop talk, in this time of fiscal crisis, of full bicycle access to the Bay Bridge. 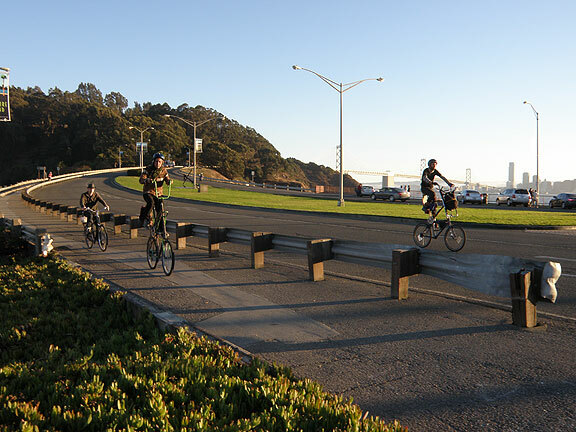 Daily bicycling has increased by upwards of 70% on both sides of the Bay Bridge but as far as Caltrans is concerned, their only mission is to maintain the bridge as a motor-vehicle-only freeway. It is a sad commentary on the nature of our government that the only way the state transit agency will take bicycling seriously as everyday transportation is when pressured by demonstrations and organized public demands. Why don’t they take the lead in opening space for cycling instead of doing everything to obstruct, deny, and prevent cycling? Why do we cyclists have to waste our time going to endless bureaucratic meetings and trying to decipher the Byzantine system of transit planning just to get what should be an obvious priority, fair access to the main trans-bay bridge? Luckily there is a relatively easy solution that doesn’t even require a reduction in motor vehicle lanes, just a simple narrowing of them. 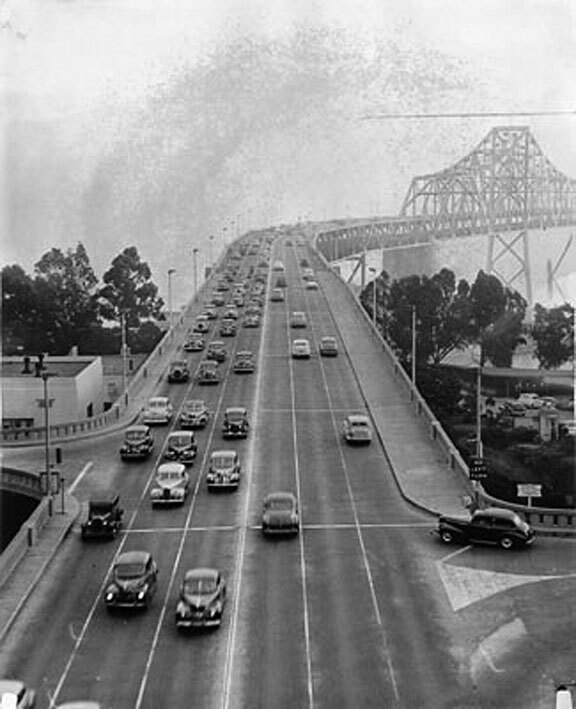 Bay Bridge with six lanes in 1946 at Yerba Buena Island east interchange. When the Bay Bridge opened in 1936, the top deck carried 6 lanes of automobile traffic, 3 lanes each way. The lower deck had truck lanes and two railroad tracks that carried Key System streetcars and intercity trains that went all the way to Sacramento. Six lanes of traffic near the Fremont exit westbound on the Bay Bridge, 1950s. After the 1962 reconfiguration of the Bay Bridge into five lanes inbound on the top deck and five outbound on the bottom, reserved for motorized traffic only, the lanes were widened to match the new freeways that were supposed to crisscross San Francisco—but those freeways were halted by outraged San Franciscans. 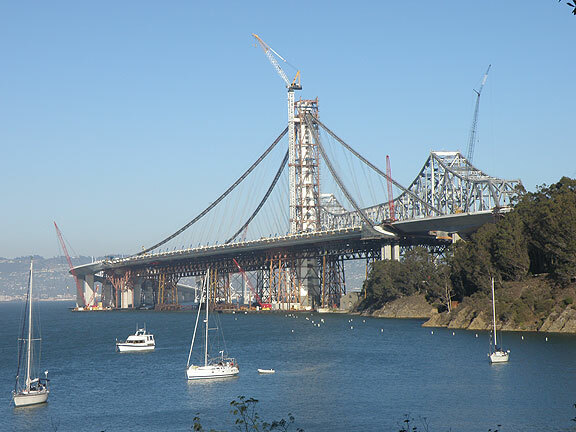 Caltrans’ insistence that the Bay Bridge is a motorized-traffic-only conduit is a legacy of plans they were never able to complete—and never will be completed! Now it’s time to reverse their wrong-headed approach and open the Bay Bridge to all types of transportation, including bicycles and pedestrians. What would it take to re-stripe the western span and lower the speed limit to make space for cyclists and pedestrians? Maybe a few hours of painting and $5,000? Twice that? The western Bay Bridge approach to SF currently has a speed limit of 50 mph and traffic often moves much more slowly than that. The lanes are super wide and can easily be narrowed by two feet each, freeing up ten feet of space for a dedicated bike-and-pedestrian path along the north edge of the top deck. At the slower speed motorists won’t lose more than a minute or two compared to current speeds (in clear traffic) on their drive from Yerba Buena Island into the City. Maybe it’s the ease and low cost that makes it a non-starter for the Caltrans behemoth. But Caltrans can’t be left in charge of this decision, having proven again and again that they are beholden to a narrow automobilistic vision of their mission. 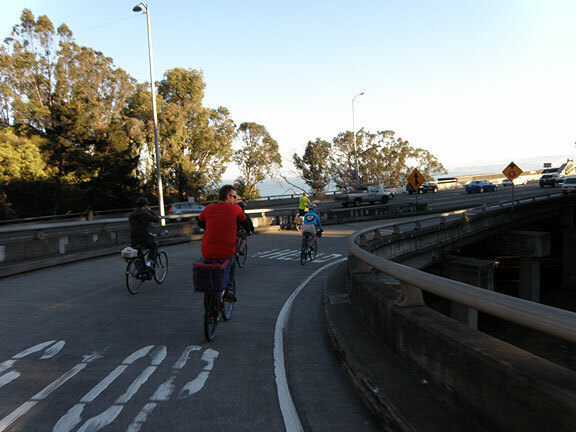 Our plan maintains current capacity for auto traffic on the bridge while opening up a path across the entire Bay for cyclists and pedestrians. Isn’t it high time that sustainable transit users get equal access to the most important Bay crossing, especially since it can be done easily and cheaply and at no one else’s expense? 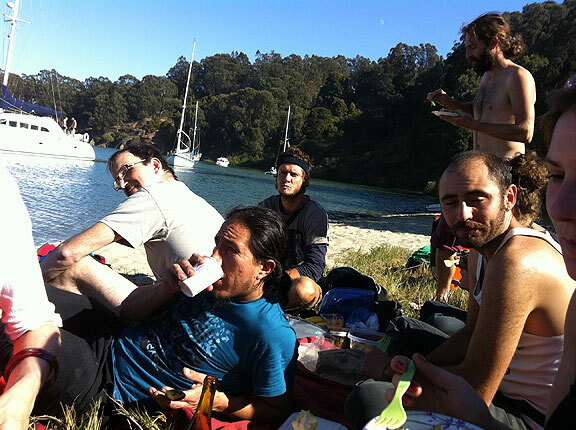 September 23rd, 2012 | Category: Critical Mass, Public Space, San Francisco news, Technology? On Friday, there will be a neighborhood arts event in the Central Market area – around 6th and Market Streets. There will be art displays in many of the businesses and art performances and interactive projects on the sidewalk (I’ll be asking people to participate in the City of Awesome project). This is an excellent program aimed at making families in the area feel safe to be outside and generating interest among others to come and support local businesses. It will be a very festive event – but the streets will remain open to car traffic. How do you imagine this playing out?